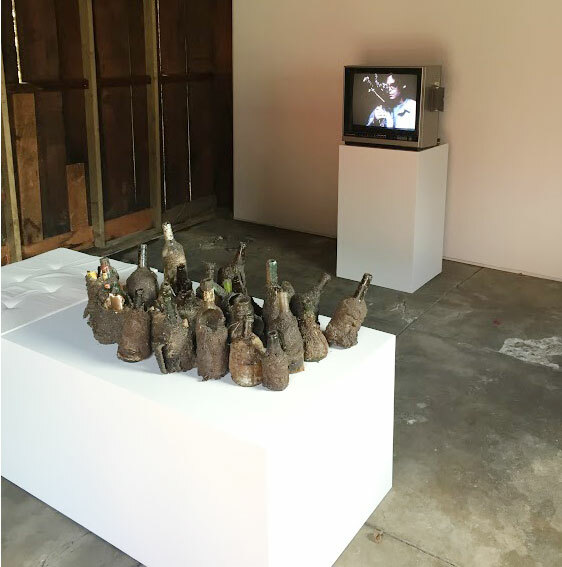 Jay Heikes | Dieter Roth, Installation view (2015). Image courtesy of Reserve Ames and Shane Campbell Gallery. The gallery Reserve Ames is located in a craftsman house in Harvard Heights. In its current exhibition, experimental short films by Dieter Roth, Kurzfilme (1956–61), play in the laundry room, and a wheezy, maundering sound piece, Harmonica Curse (Kassette 68-71, 23-30 Juli 1981), emanates from the toilet. The main action happens, however, in a barn in the house’s backyard. This concise exhibition, curated by Laura Fried, is a charming though bathetic consideration of what a daily practice might entail for an artist—what it admits, and what it sometimes leaves out. At the back of the barn, a grainy black and white video from 1976 shows Roth and his friend, the artist Arnulf Rainer, engaged in a drunken, ludic battle in a garden somewhere. It looks like they are making up the rules, then breaking them, as they go along. Duell im Schloss (Duel in the Castle) (1976) is funny, then sad, as one notices Roth failing to hide the bottle as he takes another swig. The Minneapolis-based Jay Heikes has answered Roth with his own daily practice: a set of seven of videos mixing performed and found footage, one for each day of the week, that must have taken much more than a day each to make. On the white viewing bench, beside a cushion for viewers, the sculpture Artist’s Artist (2015)—a cluster of empty bottles crusted in black steel slag and burlap—seems to grow like a malignant fungus. An empty bottle is an incriminating form of evidence. (Neighbor to alcoholic: “My, you recycle a lot.”) Nobody buys a bottle empty. Artist’s Artist is a metaphorical by-product of the creative process; while Heikes’ and Roth’s films may seem fleet of foot and light of heart, this is the heavy residue they leave behind. Jay Heikes | Dieter Roth runs from September 13–November 15, 2015 at Reserve Ames (2228 Cambridge Street, Los Angeles, CA 90006).